Fans of K-pop will love this video from last night’s SNL Korea. The Korean pop band TWICE were on Saturday Night Live Korea on October 29th. 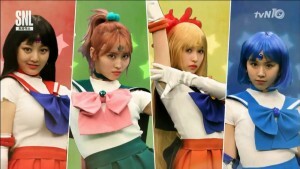 One of their skits was a recreation of the Sailor Moon opening theme which has as its music the Korean version of Moonlight Densetsu. 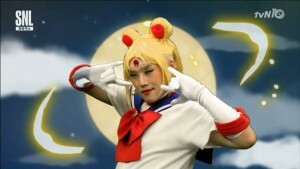 The skit has members of the band TWICE playing Sailor Mercury, Mars, Jupiter and Venus as well as Kwon Hyuk Soo, the male host of SNL Korea, as Sailor Moon. Luna is played by a human and is absolutely creepy. You can watch the clip below. 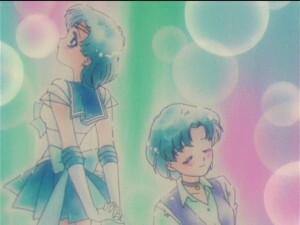 Fans may notice that the scenes from this intro aren’t all from the original Japanese intro but from the intro of the first season and Sailor Moon R of the original anime. This is because the Korean opening to Sailor Moon, like the original English dubbed intro, has a mix of scenes from multiple openings. Check out the original Korean opening below for reference. The SNL Korea version isn’t a shot for shot remake but it does a pretty good job. Source: Soompi. Thanks to Captain Genius for the heads up! 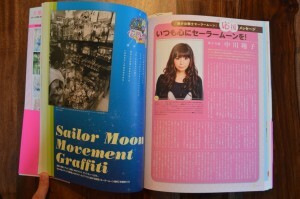 Great news for Tampa Bay area Sailor Moon fans. This weekend is MegaCon Tampa Bay at the Tampa Convention Center in Tampa Florida. In attendance will be Linda Ballantyne, the voice of Sailor Moon, and Katie Griffin, the voice of Sailor Mars, both from the original English dub of the first Sailor Moon anime series. Also in attendance will be Cassandra Lee Morris, the voice of Calaveras of the Ayakashi Sisters from the new English dub of Sailor Moon R and Sailor Moon Crystal. The main panel with Linda Ballantyne and Katie Griffin to catch is at 3pm in Saturday with “Moon Prism Power! 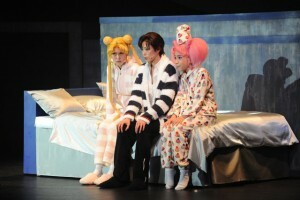 Sailor Moon Memories with Star Voice Actors”. Later Saturday at 6pm fans can see “Anime Bloopers with Cassandra Lee Morris”. Sunday at 2pm is the Q&A with Cassandra Lee Morris. All panels are held in room 18. Will any of you be at this convention? 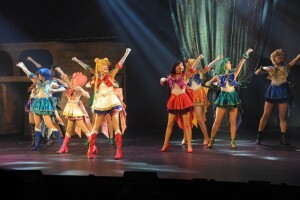 The latest Sailor Moon Musical, Pretty Guardian Sailor Moon Amour Eternal, premiered today in Tokyo. This musical covers the Dream story arc of the manga, which has the gang facing off against the Dead Moon Circus and meeting Pegasus. 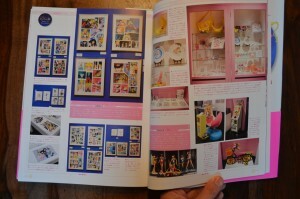 This was adapted as Sailor Moon SuperS in the original Sailor Moon anime. The main actresses playing Sailor Moon, Mercury, Mars, Jupiter and Venus are all new for this musical with the rest of the Sailor Guardians and Tuxedo Mask reprising their roles. I haven’t seen the musical yet since I don’t live in Japan. I don’t know any of the specifics about an upcoming streaming version but usually one of the later performances gets streamed which would ultimately lead to us being able to view a fan subbed version. 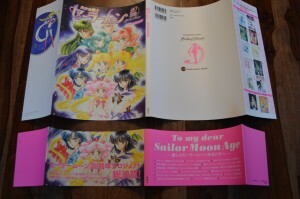 A number of English speaking Sailor Moon fans were in attendance for the premiere. Were you lucky enough to see it? If so, what are your thoughts? The DVD of the Sailor Moon Amour Eternal musical will be released on March 15th 2017. This was announced on the Sailor Moon Official Site. 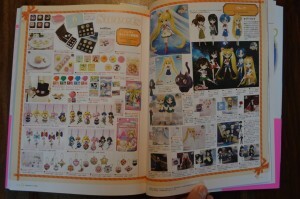 It will cost 7800 yen, about $75 US. It will include the musical and bonus features. We don’t have the specifics on those special features at this time. For more images from the musical check out Natalie.mu. 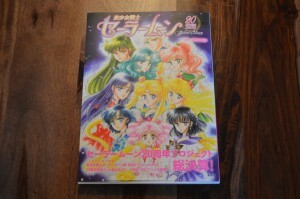 Viz held an official Sailor Moon panel earlier today at New York Comic Con. This panel mostly presented news that we already new about Viz’s work on Sailor Moon Crystal and the original Sailor Moon anime. 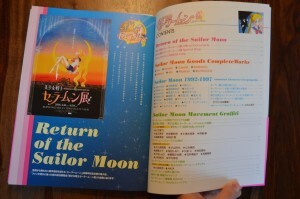 Sailor Moon S part 1 will be released on video November 15th. You can preorder it using the Amazon links below. 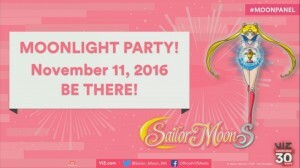 They announced that there would be a Moonlight Party on November 11th. 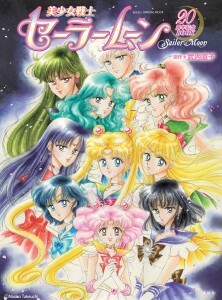 Nothing specific about episodes was announced however every previous Moonlight Party has coincided with the release of dubbed episodes of the original Sailor Moon anime or Sailor Moon Crystal on Hulu. 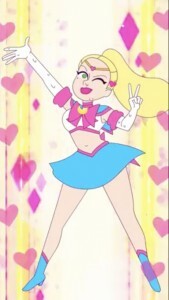 With Sailor Moon S coming out only a few days after this Moonlight Party it seems only logical that this may include the release of a few dubbed episodes of Sailor Moon S to get fans excited about the upcoming video release. 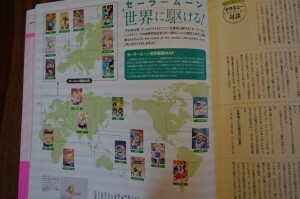 These events often include trivia contests and voice actors, though again no specifics have been announced. It’s important to note that Hulu has changed their service, restricting content to paid users. 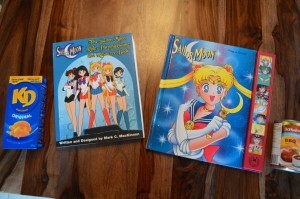 Viz’s complete Sailor Moon library is now available to stream for free on Yahoo! View. 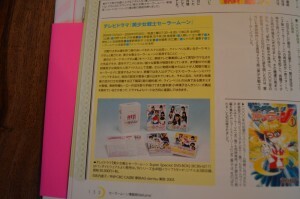 We might expect to see any new dubbed episodes of Sailor Moon S on that service as well. Sailor Moon episodes remain free to watch on Viz’s streaming service Neon Alley. This really applies to Americans. Canadians won’t be able to view any of these services and we’re not bitter about it at all! Keep in mind that this is all speculation on my part. We may be getting the lamest Moonlight Party to date and not having any episodes released! This would be completely uncharacteristic of other releases which is why I’m choosing to jump to the conclusions I am. Viz did state that this Moonlight Party would be “a little different” so this might mean “a little terrible” so take what I’m saying with a grain of salt. I’m not one to post unfounded rumours which is why I’m presenting you with all of the information and allowing you to draw your own conclusions. We will almost certain receive more specifics about this event prior to November 11th. One way or another I’ll shared those specifics on the site as we learn them. The Super Sailor Mercury figure was revealed last July at the Wonder Festival 2015 Summer. Now over a year later we have some details and a release date. 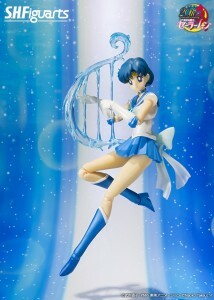 The figure will come with a harp accessory which Sailor Mercury uses during her Mercury Aqua Rhapsody attack. It will be released in April 2017. 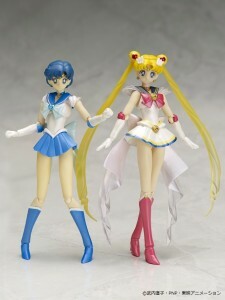 Since a standard Sailor Mercury S. H. Figuarts figure is already out the appeal of this figure seems a bit questionable. This line of figures is of a great quality and I’ve happily purchased most of them but I just can’t see myself double dipping and getting the “Super” variants of every character for another 4860 yen, about $47, a piece. 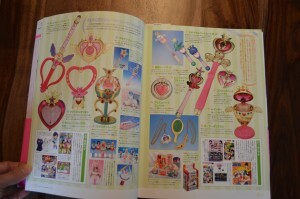 Since a Sailor Moon Crystal Sailor Moon is coming in January it seems a bit much to buy three or more versions of each character. 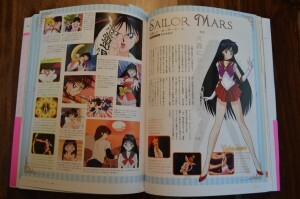 Will we be seeing Super Sailor Mars, Jupiter, Venus and the rest soon? 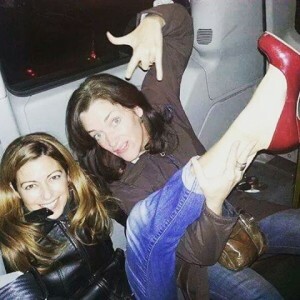 I thought we would learn about them last summer but at this rate who knows what they’re doing. It should be noted that this figure looks a bit different than the prototype we saw in July 2015 alongside the now released S. H. Figuarts Super Sailor Moon. This is normal as prototypes are always subject to change as release gets closer. Take out a line of credit and buy some of these S. H. Figuarts figures using the link below.